Thousands fled a key city in the war-torn southern island group of Mindanao as Islamist militants torched buildings, beheaded a police chief, took a Catholic priest and others as hostages, and held off security forces trying to dislodge them. "Marawi City is a ghost town now," Autonomous Region in Muslim Mindanao Vice-Governor Haroun Alrashid Lucman said in a radio interview yesterday. The crisis in Marawi forced President Rodrigo Duterte to impose martial rule across Mindanao, home to some 20 million Filipinos, on Tuesday. Mr Duterte, who cut short a trip to Russia and arrived in Manila yesterday, said he is considering placing the whole of the Philippines under martial law for the rest of his six-year term to deal with a rebellion inspired by Islamist extremism. "I may decide to expand the area to include the Visayas (central Philippines) because it is just a walking distance away actually... If I think ISIS (the Islamic State in Iraq and Syria) has already taken a foothold also in (the main island of) Luzon, and terrorism is really not far behind, I might declare martial law throughout the country to protect the people," he told reporters in Manila. 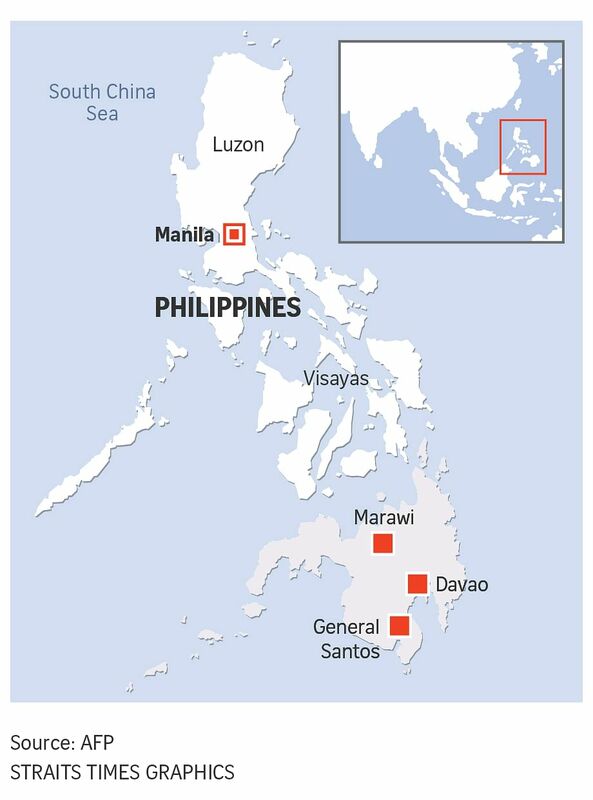 About a hundred extremists from the Maute group mounted attacks across Marawi, a mainly Muslim city some 814km south of the capital Manila, on Tuesday, after security forces raided an apartment in the Basak district to arrest Isnilon Hapilon, designated by ISIS as its top man in South-east Asia. Security analysts say Hapilon has been trying to unite groups that have professed allegiance to ISIS. These include the Maute group, which is based near Marawi. If I think ISIS has already taken a foothold also in (the main island of) Luzon, and terrorism is really not far behind, I might declare martial law throughout the country to protect the people. The militants briefly occupied Marawi's city hall, a jail, a hospital and a university. They later torched the jail, a church and two schools, and then took as hostages Father Teresito Suganob, a Catholic priest, and a couple of his parishioners and students. Colonel Edgar Arevalo, the military's public affairs chief, said five soldiers and a police officer were killed in clashes between security forces and the militants. He said 13 Maute fighters died. Mr Duterte himself disclosed that the police officer, identified as Senior Inspector Freddie Solar, was beheaded after he was nabbed at a checkpoint set up by the militants. "Things like this the government cannot allow... Government must put an end to this... I will not allow the country to go to the dogs," he said yesterday. Mr Duterte said just before he left Moscow that martial law "would not be any different from what President Marcos did. I'd be harsh". He was referring to the two-decade rule of the late Ferdinand Marcos, marked by widespread human rights violations and massive corruption, which ended with a "People Power" revolution in 1986. Mr Duterte said "the martial law of Mr Marcos is very good". To enforce the Mindanao martial law for 60 days, Mr Duterte will have to send a report to Congress, which will then decide whether to accept or reject his proclamation of martial rule. With a "supermajority" in Congress, Mr Duterte is expected to have his way.